Happy Monday! NatureBox generously provided me their October box for a review. 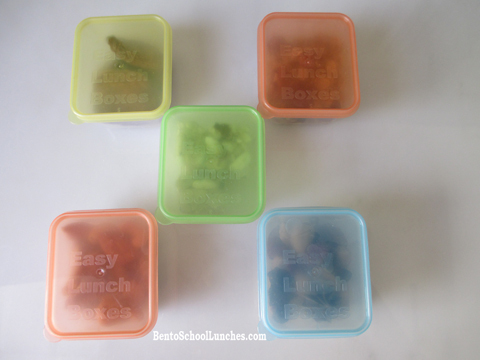 As many of you might already know, my blog is all about preparing and packing school lunches for our son. 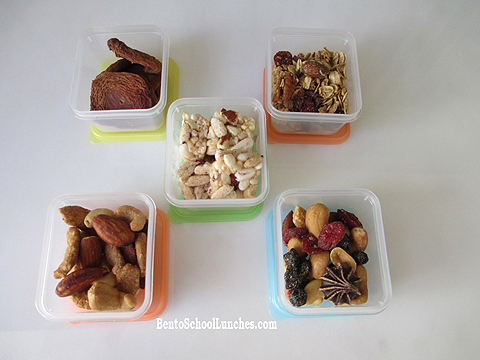 Often times, I include healthy snacks in his lunch box and I have noticed that it is often the same snacks. Grocery shopping is sometimes hurried and when such is the case, I tend to pick up the same snacks; but with NatureBox I received different snacks and every month brings a new surprise and what could be better than that? I love surprises, especially a tasty one! 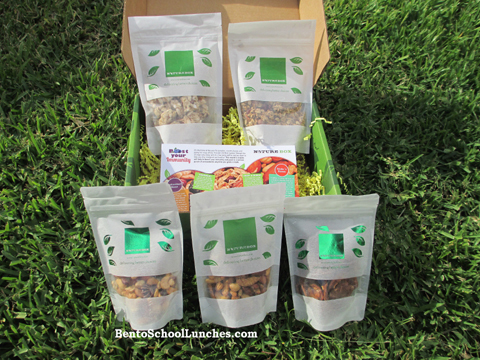 NatureBox is a monthly subscription where they surprise you with 4 to 6 different snacks each month. Nature Box only ships products that are made with wholesome ingredients. Their snacks contain no high fructose corn syrup, no partially hydrogenated oils, no artificial sweeteners, no trans fats, and no artificial flavors or colors. When I received the box in the mail I was pleasantly surprised by how big the packages of snacks were. Sun-Dried California Apricots- These Apricots are one of the tastiest ways to get in plenty of dietary fiber each day to lessen your risk for diabetes and heart disease. Cherry Berry Granola- Lightly sweetened but super crunchy mix of dried cranberries, cherries, full size almonds and whole grain oats to rev you up and keep you going. Blueberry Almond Bites- Thanks to their dark skin, blueberries are considered one of the most antioxidant-rich fruits. Antioxidant Boost- The combination of dark-skinned berries, raw nuts, and dark chocolate is a real home-run when it comes to the variety of antioxidant-rich snacks that you get in a small handful. Sticks 'n Stones- Whole almonds, cashews and sesame sticks mix perfectly roasted and with the perfect crunch. An interesting commitment of Nature Box and what I love about this company is NatureBox donates one meal for every box to feed the over 14 million children in America who go hungry every year! They believe in doing good and eating well. Each box costs just $19.95 and ships free from NatureBox and you can sign up here. 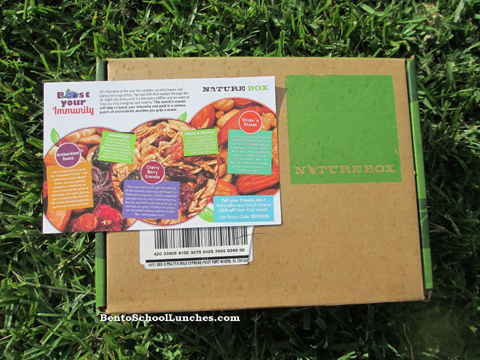 If you are interested in purchasing a subscription to NatureBox head on over to their website. The promo code BERRY may be used for 25% off your first month of subscription (please note that the 25% discount is only applicable to the month-to-month subscription. 6 month subscriptions receive 1 month free and 12 month subscriptions receive 3 months free). I like the idea of pre packing snacks for "Grab-N-Go" convenience for my family. Here is how I packed the snacks in Easylunchboxes Mini-dippers. I find that they are perfect for portion control. 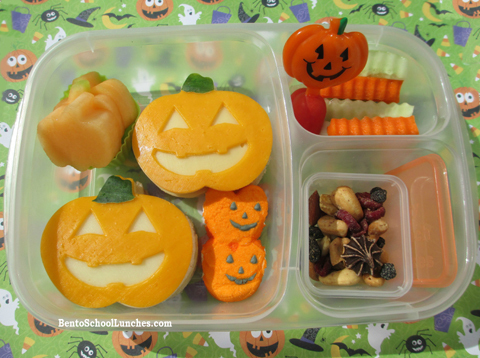 I'll be including the Antioxidant Boost snack in today's Jack-O-Lantern bento lunch. Jack-O-Lantern sandwiches with colby and smoked gouda cheese accent, cucumber peel for stems. Crinkle cut cucumber and organic carrots. Grape tomatoes with cute cupcake pick. NatureBox Antioxidant snack in Minidippers. Packed in an Easylunchboxes container. Disclosure: Nature Box generously provided me with the snacks for review without cost to me. Other than receiving the snacks, I have not received any compensation to write this review.